Visit any grocery store after notice of weather emergency and you’ll usually find that the bread, milk and water isles empty out quickly. It is natural to want to be prepared to spend days unable to get out. However, for those with illnesses, especially those on hospice or palliative care services, the list of things to do and have on hand is much longer. According to April Gall, RN, director of admissions at Angelic Health Palliative & Hospice Care it is best to prepare well in advance. "We know that snow storms, hurricanes, and nor’easters are going to hit our area, so it is smart to do some advanced planning to avoid problems that are stressful," she said. The following are 10 things you can do now to prepare in advance of a weather emergency. 1. If you are a hospice patient it is likely that staff will reach out to you when a storm or emergency is approaching. If you are living in a high-risk area hospice staff can arrange for a respite stay in a facility out of harm’s way. But this planning takes a few days, so it is best to make that decision early. 2. If you are on supplemental oxygen be sure to have a portable oxygen concentrator with a couple of extra batteries. You may also want to stay with someone who may have a generator, or arrange for respite at a care facility that has emergency power. According to Frank Tedesco, senior communications specialist at Atlantic City Electric, the company's Emergency Medical Equipment Notification Program provides advanced notice to customers participating in the program when a planned outage is scheduled to perform reliability enhancement work, or when a storm is expected to impact the service territory that may result in outages. "We encourage customers who need power for critical medical equipment at their residence to sign up for this program and to also be prepared to relocate to a facility with electricity in the event of a power outage," he explained. To apply for the program you can call 1-800-642-3780. You will need documentation from your healthcare provider that you do have and need live-support equipment in your home. 4. Have a battery powered radio, flashlight and a cell phone. For summer outages have a battery-operated fan. Be sure to have extra fresh batteries and keep phone charged. 6.Staying hydrated is very important year-round. You can become dehydrated any time of year. Summer is especially concerning if you lose power and air conditioning. It is particularly important to have plenty of water. Filling a bathtub is recommended. You may need sterile water to clean wounds so boil water prior to a storm coming and keep it in a sterile container. 7. Maintain a first aid kit with antiseptics like alcohol, hydrogen peroxide, band-aids, gauze, tape, and white vinegar to sterile nebulizers. 8. Be careful about using space heaters. Kerosene puts out toxic fumes which can be especially harmful to those who are ill. Also, be mindful of open flames near oxygen. It is recommended to say at least eight feet from a flame if you are on oxygen. Fire and O2 is a recipe for disaster. 9. Let others know your situation. Neighbors, friends, church groups, emergency services are great resources. Don’t be afraid to ask for help. 10. Remember ABC… Always Be Calm. Staying calm allows you to think with a level head. 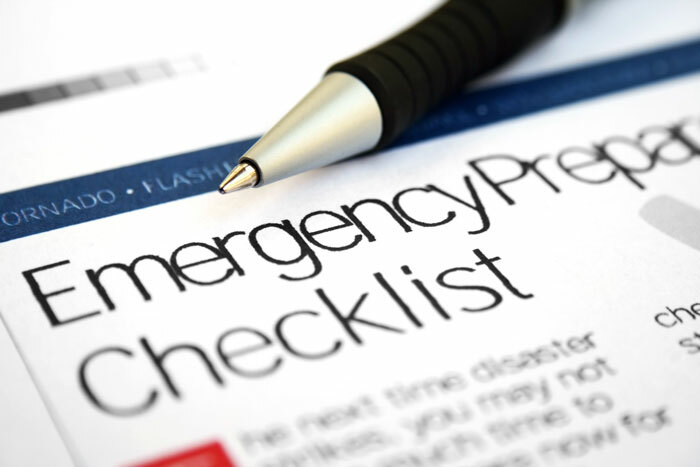 Preparing in advance of an emergency will give you more control over the situation. Thinking ahead allows time to prepare your particular needs list for that rainy, stormy, windy or snowy day. We are available at 609-822-7979 to answer your questions if you or a loved one has a life-altering illness and have concerns about emergency preparedness.